Sometime between the 3rd and 4th centuries AD, Our Lady appeared in Le Puy (Haute-Loire, France), in a chapel built by the faithful few years before on a high mountain, to a woman recently converted to Christianity. Villa was plagued by a serious illness and no doctor had been able to help. Our Lady, during her appearance, completely cured her. The news of the miracle spread quickly and many people came to the chapelin thanksgiving. The Blessed Virgin Mary heard the prayers of many that were sick and that place of grace became a place of frequent pilgrimages. The various successive bishops in the diocese, built a magnificent church, which in 1254 was enriched with a precious painting of the Virgin Mary, donated by the King Louis IX. According to the Canon Fayard, a historian, Sometime between the 3rd and 4th centuries AD, a converted woman named Villa living in Le Puy, in modern-day France, fell gravely ill. The Mother of God asked the woman to go to Mount Anis, also called Corneille Rock, and to lie down on a megalithic flagstone. The widow stood up cured. The Virgin asked her to have a church built on the spot, which has become one of the oldest sanctuaries dedicated to the Mother of God. Appearing to the woman a second time, Mary gave instructions that the local bishop should be contacted and told to build a church on the hill. According to legend, when the bishop climbed the hill, he found the ground covered in deep snow even though it was the middle of July. A lone deer walked through the snow, tracing the ground plan of the cathedral that was to be built. Convinced by these miracles of the authenticity of Mary's wishes, the bishop completed construction of the church by AD 430. Despite ecclesiastical pressures, which sought to combat the survival of pagan religious practices, the great dolmen was left standing in the center of the Christian sanctuary and was consecrated as the Throne of Mary. Soon this sanctuary became very popular, as proved by a text of Gregory of Tours in 591. The Emperor Charlemagne and many kings of France went there to pray to the Black Virgin. Pope Leo IX wrote, "In this sanctuary on Mount Anis more than anywhere the Blessed Virgin Mary has received veneration, honor, and the love of a great many believers in the country." A precious painting of the Virgin Mary was donated by King St. Louis IX. On the main altar there is the Black Virgin, a statue that replaces a previous effigy burned during the French Revolution in 1794. The original was a statue of cedar, probably coming from Egypt and Eastern depicting a goddess, offered by Louis IX on his return from the Seventh Crusade. 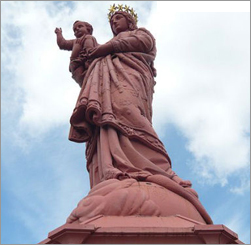 A gigantic statue of the Virgin Mary was erected on a high pedestal, who put her gaze from the highest point of the mountain to as far as the eye can see. Le Puy still remains one of the most famous pilgrimage destinations. The feast of the Black Virgin of Le Puy-en-Velay is celebrated on July 11. After seeing Our Lady, Villa was cured and built a small chapel on the site of the apparition. Throughout history, other miracles were performed there, which gained a certain popularity for the shrine. Crowning the summit of Mount Corneille in the Auvergne region of central France, the cathedral of Notre Dame in Le Puy is one of Europe's oldest, most famous and most beautiful pilgrimage shrines. Much visited during medieval times by pilgrims on their way to Santiago de Compostela and highly venerated for its Black Madonna statue, Mount Corneille's use as a sacred place has its roots in prehistoric times. Prior to the arrival of Christianity an enormous dolmen, or single standing stone, stood atop the sacred hill. Nothing is known of the people who erected this stone nor of the manner in which it was used, yet the mysterious stone was to play a decisive role in the development of Le Puy as a Christian pilgrimage site. This apparition was not formally investigated but has traditional approval of the Church. In 1051, Pope Leo IX wrote, "In this sanctuary on Mount Anis more than anywhere the Blessed Virgin Mary has received veneration, honor, and the love of a great many believers in the country." Mullen, Peter. Shrines of Our Lady. MiracleHunter.com is the best resource for Marian Apparitions on the web. The site includes approval lists, visionary biographies, detailed apparition summaries, messages, official Church statements and a photo gallery.